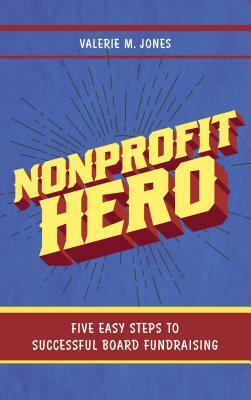 Nonprofit Hero is written by Valerie Jones, who has raised more than $175 million for nonprofits and coached thousands of people to authentically and successfully ask for the causes they care about. She's addressed more than 50 audiences from Baltimore to Beijing and is one of fewer than 10,000 Certified Fund-Raising Executives (CFREs) worldwide. In addition to running her boutique consulting firm, Valerie M. Jones Associates (VMJA), she's volunteered extensively, serving nonprofits as president, chair, board member, and committee member. Her method works. Trained boards report increased comfort and willingness to ask. Many indicate they are prepared to ask for bigger gifts, can identify more prospective donors, and intend to contact these prospects sooner. Her book, Nonprofit Hero, contains stories, tools, and exercises not included in trainings. Readers will learn how to: -Honor their fears. Surprisingly, these contain their personal prescription for success. -Channel their passion by tapping the energy of why they want what they want. -Discover their asking personality, including how they should and shouldn't ask. -Get started with tips on thirty simple things to do right now for free to help raise money. -Follow five easy steps, starting with thanking, not asking, and with givers, not prospects. -Cast themselves as stars, finding the step they'll most enjoy and at which they'll excel. -Attract support by listening, understanding motivations, and helping fulfill donors' desires. -Elevate their speech so that they can make their case sincerely and with compelling confidence. -Get in the right frame of mind to show up ready for "yes," not braced for "no." This book also helps readers form an in-depth description of their asking personality. It illustrates how they can best thank, steward, research, cultivate, and ask; which of the five steps they favor; how to address their fears; play to their strengths; overcome their weaknesses; and how to get what they need to excel. There are 16 different and distinct profiles, one suited to each reader. Finally, this book includes a toolkit of practical samples and templates, such as sample giving dos and don'ts, asking scripts, and fundraising plans.